Jun. 28, 2013 6:00 a.m.
Front row L-R: Robert McMullen, Linda Weber, Joyce Johnson, Al Hegge, Jean Scott. For years Joyce Johnson of Millet, Alberta has dedicated her valuable time and energy to help a multitude of community organizations that needed her assistance. In total, over 32 organizations have benefited from her giving so freely of her time and efforts. Joyce was recently a semi-finalist for the 2013 Volunteer Citizen of the Year Award and in addition to the honor, she also received a $1000 grant that she designated to the Millet & District Historical Society as her charity-of-choice. The Volunteer Citizen of the Year Award is in recognition of dedication and significant contribution to many communities by volunteers. 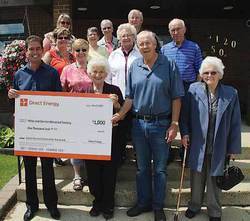 The Award program is sponsored by Direct Energy and the Alberta Weekly Newspapers Association (AWNA). Direct Energy is one of North America's largest energy and energy-related services providers with over 6 million residential and commercial customer relationships. Direct Energy provides customers with choice and support in managing their energy costs through a portfolio of innovative products and services. A subsidiary of Centrica plc (LSE: CNA), one of the world's leading integrated energy companies, Direct Energy operates in 46 states plus DC and 10 provinces in Canada. To learn more about Direct Energy, please visit www.directenergy.com. Alberta's community newspapers reflect the images, thoughts and everyday happenings of the communities they serve. While these communities may vary in size, from tiny, isolated locations to bustling suburban centres, they share one important feature – a strong weekly newspaper. Today there are over 120 member newspapers throughout Alberta and the Northwest Territories. They boast a combined circulation of 900,460. The smallest newspaper circulates 443 copies each week; the largest – 127,593. We are part of a Canada-wide network of community newspapers through the Canadian Community Newspapers Association (CCNA). Together with six other provincial associations, we represent nearly 650 newspapers.